Have You Suffered Serious Injuries as a Result of a Wooden Porch or Deck Collapse? Parker Scheer Attorneys have Successfully Represented Persons Seriously Injured as a Result of Collapsed or Rotten Decks. In many cases these injuries can result in life-long pain and physical limitations, and require expensive surgeries and rehabilitation. For more than twenty-five years, the attorneys at Parker Scheer have successfully represented victims of deck and porch collapse. Determining who is at fault for a collapsed porch or deck can be complicated. Under Massachusetts law, the owner of the porch or deck has a legal obligation to maintain their premises in reasonably safe condition and to conduct reasonably frequent inspections to identify rot, structural damage, pest infestation, or other defects which could result collapse or other catastrophic failure. The more common causes of porch and deck collapse include the decay of wooden support timbers caused by excessive moisture, or wood-consuming insects; rusted nails or metal fasteners resulting from prolonged exposure to the elements; and errors in structural design, fabrication, or construction. Deck collapse can also occur where an owner has allowed excessive weight to be exerted on the porch or deck, such as a hot tub, heavy outdoor furnishings, or appliances, which exceed the load capacity of the porch or deck. The over-loading of guests on an already compromised porch or deck is another common cause of deck collapse. “Do-it-yourselfers” and inexperienced builders frequently fail to construct porches and decks in conformity with State and local building codes. In some instances the materials used in constructing the porch or deck are inappropriate for their intended application or location, and carry an increased risk of injury. One of the most common materials linked to deck collapse is the use of non-pressure treated lumber, which does not resist rot to the same extent as pressure-treated lumber. For more information about your potential case, or to speak directly to one of our highly experienced Massachusetts personal injury attorneys, contact us, toll free, seven days a week, at 617-886-0500. There is never a charge for an initial consultation and all information supplied is maintained in strict confidence. 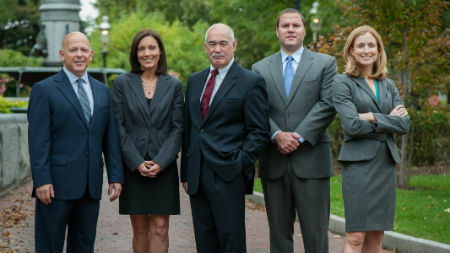 If you need a lawyer outside of Massachusetts, contact us for a convenient referral.